Amy Skelton badly injured her right knee in a high school soccer game after her cleats stuck in the grass. “My body went one way, my knee went the other,” she said. That injury led to an adulthood of lingering pain and the thousands of daily compromises Skelton made to appease her aching knee over the next 30-plus years. In time, she no longer felt comfortable doing the things she loved. A trip to a theme park with family became a chore, a nature hike a painful, annoying march. “I just didn’t trust my knee anymore,” said Skelton, 49. Skelton finally had knee replacement surgery at University of Florida Health. In doing so, she became an early participant in a redesigned joint-replacement program started in 2015 that has transformed and improved the patient experience at UF Health. Three years later, the patient- and family-centered care program has shown improvement in nearly every major metric of patient care while also reducing costs. UF Health study findings published in the journal Arthroplasty Today in March show hospital stays have been shortened, from 3.5 days to 2.1 days; readmissions have dropped from 4.9 percent to 3.9 percent; the rate of complications has fallen from 2.3 percent to 1.9 percent; and nearly 87 percent of patients are being discharged home rather than to a rehabilitation facility, compared with 62 percent previously. Patients’ mobility also is vastly improved. At the heart of the program’s effectiveness is the concept of bringing everyone involved in the patient’s care under one umbrella. This multidisciplinary approach, leaders say, creates opportunities for excellence. On the road to recovery, being home makes all the difference. Skelton was home hours after her surgery, and physicians and nurses anticipated her concerns and needs. A nurse visited her house her first night back. Program surgeons say patients face fewer complications at home compared with what they experience in the hospital or in rehabilitation. They recover faster and more safely under their own roof and their mind is in a better place psychologically. The program model, which differs from the usual standard of care at most hospitals, changed the culture across the care continuum so that patients and health care professionals come to expect early mobility. Lee Brown Jr., 65, owner of a heavy equipment business, damaged his right knee in a tractor accident 40 years ago. By the time he reached his 60s, the pain had become too much. Brown was having trouble climbing onto the heavy equipment he needed to inspect for his business. He decided to have knee replacement surgery at UF Health Shands Hospital. Brown said he was especially pleased with the responsiveness of his surgical team to his questions and the ability to reach his surgeon. Brown spent only one night in the hospital, and was quickly back on his feet. The joint-replacement program emphasizes patient education and provides access to a seven-day-a-week after-hours orthopaedic practice to avoid unnecessary and expensive visits to the emergency room. 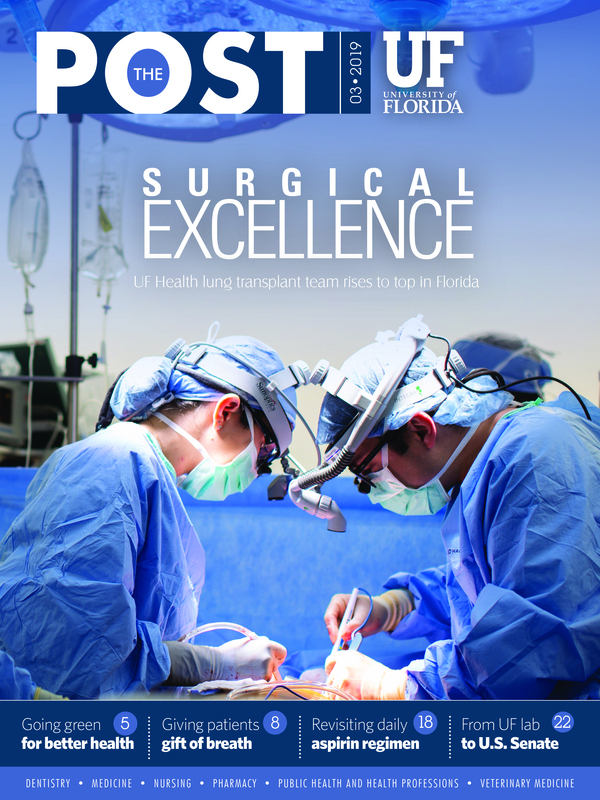 A collaboration with the UF Health anesthesia acute pain service allows for optimal use of regional anesthesia such as nerve blocks, which have dramatically improved pain control while allowing mobility and reducing narcotic usage. Additionally, the program hired a “nurse navigator” to help coordinate patient care and address patient needs. Age 74 when he had his surgery in early 2017, Denny Gies was in the hospital just one night after his hip replacement. “They had me up and walking the afternoon of my surgery,” he said. He did his rehabilitation at home. In two weeks, he didn’t need a walker. Before the surgery, Gies said pain prevented him from climbing a flight of stairs. Today, he often walks 10,000 steps a day.